The Cheltenham Gold Cup, open to horses aged 5 and over, is a Grade One National Hunt race, and the jewel in the crown of the prestigious four day Cheltenham Festival. It’s held in March of each year and the race is run over 3 miles 2½ furlongs, featuring 22 jumps. 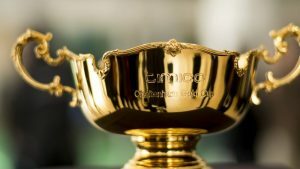 The purse for the Gold Cup is a very healthy £575,000 with over £325,000 of that going to the winner. As with many of our most treasured and respected races, it holds no shortage of history. The first Cheltenham Gold Cup was run in July of 1819 at which time it was actually a flat race. It wasn’t until 1924 that hurdles entered the equation and the race became what we know it as today. With so much history behind it, it’s no surprise that the Cheltenham Gold Cup is seen by many trainers and owners alike as ‘the one to win’. It’s something of a legend maker with the likes of Kauto Star, Best Mate, Desert Orchid and Arkle all staking a claim to greatness by their performances in the Gold Cup. Arkle won the race in three successive years from 1964 and 1966, and Kauto Star had an infamous rivally with Denman, becoming the only horse to ever regain the Cheltenham Gold Cup title in the process, after first winning in 2007 and then again in 2009. Other stand out performances in the Gold Cup include 100-1 Norton’s Coin winning the 1990 race and Coneygree becoming the first novice to ever win it in 2015. Golden Miller is the most successful horse in the Cheltenham Gold Cup, eclipsing them all with five consecutive wins from 1932 to 1935. Jockey Pat Taaffe and trainer Tom Dreaper are also stand outs in terms of achievement, with 4 and 5 wins respectively under their belts.